Liza is a loved member of our family and has been since we adopted her on 7 June 2008. She went shopping with us at Pet Smart on the way home to San Antonio from Austin. She helped pick out her bed, lease, collar and dog bowl. She even got some bling (a pink heart ID tag). She took a bath once we got home to freshen up from her long day, ate a good dinner and crashed early. 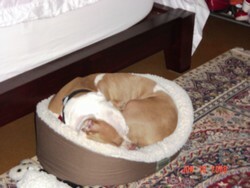 The first week she slept in her crate at night and when we left the house we crated her too. After a week she joined my son in his bedroom at night in her new 2d dog bed (I think she is making out on this deal). We will still crate her when not at home just to be safe because of our second dog and the relative newness of their relationship but hope to someday have them roam freely around the house when we are gone. She is keeping her girlish figure by accompanying me on my walks. She has gone to Starbucks and Panaras and behaved wonderfully. Not one person could pass her by without petting her. She enjoys all the attention. We look forward to adopting another boxer later this year – we want a less then year old male. Wyatt will then have the privilege of training this young dog. Thanks for all you do for both boxers and our society!